BlogHome » BLOG » Kitchen Cabinets: Should You Replace or Reface? Making the decision to replace or update your kitchen cabinets can be a hard decision. If you want a brand-new look in your kitchen, but the thought of replacing them – and paying for all new cabinets – worries you, consider what cabinet resurfacing can do. For many people looking for kitchen refacing in Phoenix, turning to a professional helps save time and money. There are some situations where replacing your kitchen cabinets is essential. The most common time for this is when there is significant damage to the wood. For example, you may have missing components, mold or mildew damage to the wood, or the wood-like material is falling apart. When their structural integrity is very bad, it may be time to consider replacing. On the other hand, if your kitchen cabinets need a new look or do not match your home’s new or upcoming design, refacing is the way to go. 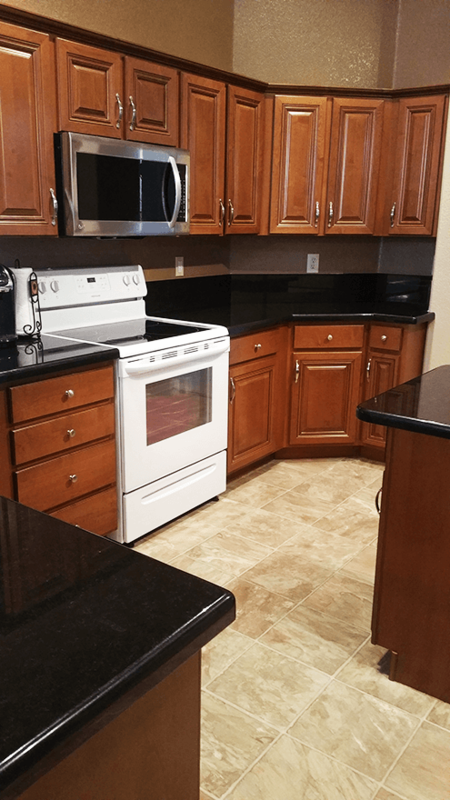 With the help of kitchen refacing services in Phoenix, you can transform your kitchen with a brand-new look, new color, and even a new wood grain look. You end up with an impressive finished piece. Even if your cabinets have some damage to them, it is possible to utilize refacing methods. Done by a professional, this process can do away with scratches, minor damage, stains, and much more. It creates a brand new, beautiful look to your cabinets. In many ways, kitchen refacing can help you achieve new kitchen without the expense of replacing cabinets. When it comes to cabinet refacing Phoenix, Better Than New Kitchens LLC has the tools and resources to help you. Before you replace, talk to our team about refacing, refinishing, and rebuilding your cabinets. Call us today for a free estimate.